Washing your face can already feel like a chore, but a necessary task unless you want your skin to rebel in breakouts and blemishes. Sometimes even though you know you always feel better after a face wash, you still struggle through the motions, whether you’re sleepily trying to wake yourself up or whether you fell asleep on the sofa watching Netflix but need to wash up before hitting the actual sack. If you find that you’re rubbing harder than necessary or need to rinse for what seems like ages, your own mitts may not be working hard enough. All that extra rubbing isn’t doing a whole lot more than probably irritating your skin, especially around the sensitive eye area. Have you ever thought about employing a bit of assistance in the form of a simple washcloth? We’re not talking about the terrycloth nightmares your mother might have used (which always get really rough-feeling the more you wash them). There are newer, gentler versions meant for thorough cleansing without over-scrubbing. First of all, why would a washcloth work better than your hands? Do you wear a lot of makeup? When you blot your face dry, are there bits of eye makeup that rub off on your towel? A washcloth can help more thoroughly cleanse, especially if you use oil-based cream cleansers. Choose your cloth. Washcloths these days seem awfully aware that you can get too much of a good thing. That’s why lots of them will feel like soft clouds probably fit for a baby more so than your face. Lots of them are made from muslin, a thin plain cotton cloth with a bit of a loose weave so you can see through it almost. Muslin cloths are great because they’re gentle on skin and easy to rinse out and they dry quickly. Bamboo and microfiber are also other soft options. It’s really all personal preference. More means less. Since you are using a textured implement to clean your face, it would theoretically do the job quicker. This means, you shouldn’t be washing your face for as long since your hands are softer and less rough on your skin. A cloth rubbed with the same pressure and friction as your hands can potentially rough up your skin, leading to redness and blemishes, so ease up when you’ve got reinforcements. Scrub lightly. Of course, using a washcloth is the perfect manual exfoliator. You don’t have to worry about plastic beads washing down the drain and killing fish, for one. There are exfoliating washcloths for this express purpose. You really should only be using these once or twice a week, and only if you don’t normally use a regular washcloth daily. Take care of your cloth. Like any shower accessories, when left in a damp, humid environment, bacteria is practically teeming. Your washcloth is now potentially home to such bacteria, if you don’t rinse it out properly and hang it to dry thoroughly. Always fully rinse out cleansers, makeup residue, and soap from your washcloth after using. Wring out as much moisture as possible, and hang it it to dry in a place that’s well-ventilated. This will inhibit bacteria, mildew, and mold from growing. You should throw your washcloth in the laundry every few uses however, depending on how much makeup you’re removing, and how thick or oily of a cleanser you use. Ideally, you could use a fresh washcloth every face-wash, but as long as you take the aforementioned precautionary measures above, you can get a few uses out of one. Steam one out. One great thing washcloths can do pretty easily for you is a good steam. While cleaning your face, massage your cleanser onto your skin, but instead of rinsing right away, run your washcloth under the hottest water you can stand and wring it out but not completely. 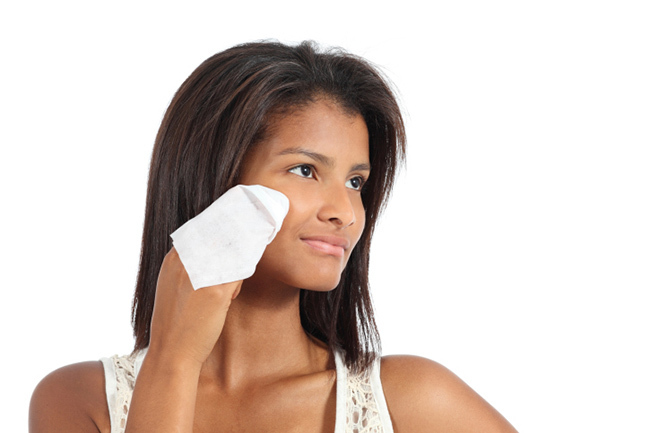 Lay the hot washcloth over your face and let it sit there for a bit steaming your cleanser into your pores. When it starts to chill off, just wipe away your cleanser. This works great for any oil-based heavy duty cleansers, especially if you carefully rub cleanser on your eye makeup to break it up before you sweep it away with your washcloth.